The first year of marriage can be difficult. But for Jonathan and Caitlin, it was life or death. Their story is a testament to love’s power over hardship and the good plan of a good God. Not long before their wedding, Jonathan discovered that his kidney was failing. This was not the first time. When he was 18, he received a kidney transplant from his mother that saved his life. Now the other one was going. The odds were long for finding a second kidney. The doctors told him it could take 10-15 years. Only 1 percent of the population were a match for the donation. If he survived the wait, he would spend it on dialysis. When he told Caitlin, he made sure she knew she had options. If she wanted out now, he would understand. This is not the life a young bride dreams of. Caitlin, however, was prepared to marry “for better or for worse, for sickness or in health.” Last October, Jonathan and Caitlin walked down the aisle and Jonathan went on the transplant list. Through the winter, they enjoyed their new life together and waited. Then, something unexpected happened. In the spring of 2012, they discovered that Caitlin was a match to donate a kidney. Despite the overwhelming odds, Jonathan had not only found the perfect match for his life but also the perfect match to save his life! 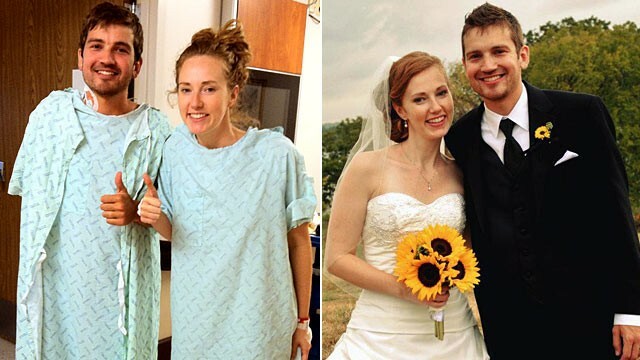 Eight months into their first year of marriage, Caitlin gave her new husband one of her kidneys. How are you and Caitlin doing? Caitlin and I are almost 4 months out now. I go to the doctor for blood tests about every week and right now my kidney function is normal and so is Caitlin’s. I am off all blood pressure medicines and they are lowering my immunosuppressant drugs. A kidney rejection is most likely to happen in the first few months to a year and we have had no rejection so far…a huge praise! Also, Caitlin and I just celebrated our one year anniversary last week. What have you learned about God through this process? I know we both have been humbled by the providence of God. All things are from His hands are His hands are good hands. It makes me think of when Jacob was weeping in Genesis 37 thinking Joseph was torn to pieces and the text says “Meanwhile.” Jacob sees a bloody robe but Joseph is on his way to Egypt. We have seen how God is at work even in the darkest of times working for our good and His glory. It is Genesis 50:20, You meant evil but God meant good. A world full of suffering and disease and hardship but a God whose Sovereign, Providential Loving hands continue to work in it all and even have a greater design and meaning then we can see. Psalm 146:3-4 says “Do not put your trust in princes, in mortal men, who cannot save. When their spirit departs, they return to the ground; on that very day their plans come to nothing.” This has been a bedrock as we have fought and continue to fight not to put our hopes in pieces of paper with lab numbers or in doctor’s predictions but in our constant Lord. It has given us a gratitude for each other. Definitely not a lack of fighting or issues or whatever else in marriage. But we have a deeper love and appreciation for each other. I know Cait has modeled Jesus to me so much. Our culture sees marriage as what can I get and she saw it as “What can I give.” She saw Christ who came to serve and not be served and she has said that is how she tried to enter marriage. I have been so blown away to see this type of giving and sacrificial love and it challenges both of us to model this also in the seemingly ‘small’ and ‘everyday’ moments of life. Hear more of Jonathan and Caitlin’s story from their ABC News interview. Leave a comment below, I will make sure Jonathan and Caitlin see it. That’s an amazing story of trust in God! Thanks for sharing it! Your welcome. Isn’t amazing how hard things clarify the good things in our life.